not go on the hike. We then drove our cars and met at the picnic area on Sudley Rd. at 9am to begin the hike. 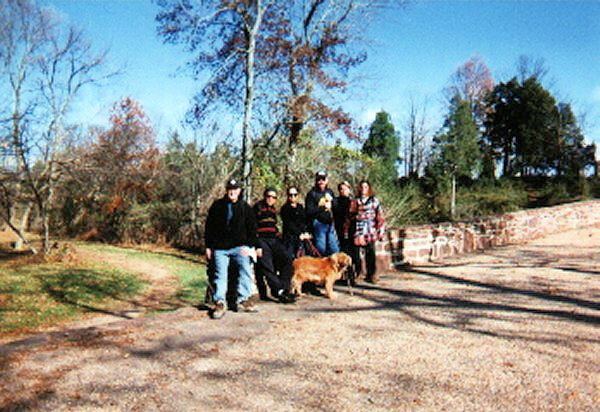 At right, the group picture in front of the Stone Bridge. It was a clear cool Autumn day. We did about 10 miles around the perimeter of the battlefield. There were alot of monuments and historical markers. One gets a strange feeling walking through a forest where thousands of young men died. We did this hike during the federal government shutdown. Technically, the park was closed so we weren't sure if we were supposed to be there or not. About half way around we spotted a park ranger. We thought we would be asked to leave but the ranger just said to stay in the woods. At about the 8 mile mark we spotted a couple on some horses. The guy was trying to impress the girl so he started galloping around a field. Well, his saddle slid down the side of the horse, throwing the guy and allowing the horse some freedom as he took off over a knoll. The guy went running and the girl went galloping after the runaway horse. The hike ended around 2ish. It was a fairly easy hike. A great way to spend a Saturday afternoon in a place that played a significant roll in history.